Let’s Vote in a new Treasurer! After almost half a year without a Treasurer, it’s about time we vote one in and complete our team as we start looking ahead to the spring semester. 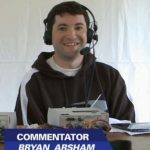 Thanks to the nominations from our last vote, Bryan Arsham, AEPi Alum from 2010 2008 and new Broadcaster as of last year, has offered tohelp us out. So now it’s our responsibility to show our confidence in his abilities and confirm his nomination. Please comment below with you vote for or against his confirmation, and feel free to include any questions for him if you have any. Voting period through Monday Nov. 20th. Mini-Raceday Results will be coming out with the rolls report later this week! I’ll kick things off and put in my vote of confidence for Bryan. As the immediate past treasurer-Bryan has my full confidence! Hey everyone… If you’re wondering, here’s a little bit about me. As Ben said, I’m an AEPi alum (actually the class of 2008, not 2010, but I stuck around Pittsburgh for a couple of years after graduating and spent most weekends out at rolls like a crazy BAA person would). I spent 1.5 years as treasurer of AEPi (my second term was cut short because of my spending a semester in Australia), and worked as a financial analyst for 2 years after graduating, before ultimately going to law school and becoming a lawyer. While I make my real living as full-time Buggy Broadcaster (to an audience of 1), I now moonlight by living in LA and working as a lawyer for Fandango. I’m honored to be considered and, if approved, I look forward to serving as the next Treasurer of the BAA. Well, those convinced me! Another vote for confirmation. I vote yes. have fun. Thanks for all the votes everyone, We’ve got a full team once again!